HTTP flood is a layer 7 DDoS attack that targets web servers and applications. HTTP floods are designed to overwhelm web servers’ resources by continuously requesting single or multiple URL’s from many source attacking machines, which simulate a HTTP clients, such as web browsers (Though the attack analyzed here, does not use browser emulation). When the servers’ limits of concurrent connections are reached, the server can no longer respond to legitimate requests from other clients attempting to connect, causing a denial of service. HTTP flood attacks use standard URL requests, hence it may be quite challenging to differentiate from valid traffic. Traditional rate-based volumetric detection, is ineffective in detecting HTTP flood attacks, since traffic volume in HTTP floods is often under detection thresholds. Before sending a HTTP request a TCP connection between a user agent and a server is established, using 3-Way Handshake (SYN, SYN-ACK, ACK) , seen in packets 6,7,24 in the example above. HTTP request packet will generally be in a PSH, ACK packet, as seen in packet 25 above. 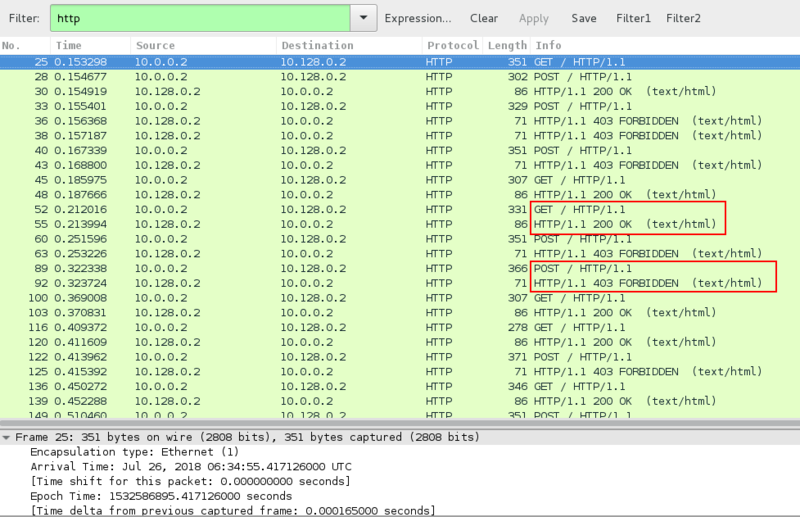 An attacker (Ip 10.0.0.2) sends GET / HTTP / 1.1 and POST requests, while the target responds with HTTP/1.1 200 OK and HTTP/1.1 403 accordingly. As seen in the image above. The capture analyzed is around 9.7 seconds and the average number of packets per second are around 198 PPS, with a rate of around 0.28Mbps per second (considered low, the attack you are analyzing could be significantly higher).